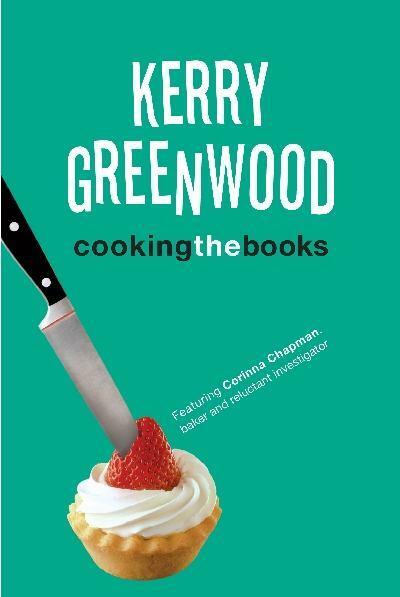 Cooking the Books is a mystery novel by Australian novelist Kerry Greenwood. The book isn’t actually due out in the US until later this spring, but I am an impatient person. I got a friend to pick up a copy on her holiday trip to Australia. I finished it in two days. One thing to know, I’m mildly obsessed with this author. Cooking the Books is the latest book in her Corinna Chapman series. Corinna is a baker in Melbourne. She lives in a reconstructed Roman apartment building named Insula. She has an apprentice named Jason and a boyfriend named Daniel. All of this, except perhaps the apartment building, sounds very tame. But these books are to tame what Wonderbread is to homemade focaccia. Insula is studded with interesting people; two aspiring actresses, a retired Classics professor, a witch, a weaver, a society hostess, and a rotten little doggie named Traddles. Jason is a 16 year old recovering addict who has managed to rebuild his world around feeding people. Daniel is ex-Israeli army and now works as a private detective. In this installment of the series Corinna’s bakery, Earthly Delights, is closed for a month’s vacation. Jason is out at the beach. The shop assistants have gotten roles in a new tv pilot. Daniel is on a fiendishly difficult case involving mislaid bonds. Corinna is expecting a month of relaxation and quiet. However, events and old school chums conspire against her. Thomasina, former school chum and current caterer has had a baking related disaster. Her pastry chef has broken a leg and is unable to work. This is a disaster because the company has just gotten a contract to do all the catering on a new tv pilot that is about to start filming. Corinna reluctantly agrees to take up her rolling pin in a good cause. Besides, it gives her an excuse to check in on her assistants and make sure they’re eating enough. Naturally, things get more complicated. The production is being plagued with mishaps. Most of them seem to be aimed at the highly temperamental star of the show. If the star walks then the entire pilot collapses. Thomasina and all her assistants are out of a job. Corinna’s assistants lose their best chance at breaking into acting. The director loses her pet project. Soon all of the cast and crew are looking at Corinna to figure out a solution. Meanwhile, Daniel is trying to help a young accounting intern who has managed to mislay a huge stack of bearer bonds. He knows that one of the bonds has been cashed in by a homeless man named Pockets. Unfortunately, Pockets’ connection with reality is tenuous at best so he can’t just tell Daniel where the rest of the bonds are. They have been filed, Pockets states, in the proper place. The intern who lost the is facing not just the loss of her job, but possibly the end of her career. Things in the accounting firm aren’t what they should be. For starters, why was an intern walking through town with millions in bearer bonds. That just seems to be asking for trouble. Daniel begins to suspect that the bonds may not have gone missing by accident. Kerry Greenwood writes fun, fast paced mysteries with delightful characters. If I thought I could find Insula I’d pack my bags and move to Melbourne tomorrow. Her other series is the Phryne Fisher series, which is set in Melbourne in the 1920’s. Phyrne is a well bred, well monied, charming young flapper who takes a dim view of murder. She is dashing, lovely, and thoroughly unexpected. In other news, I have finished The Red Pyramid on audio and stared on Phoenix Rising: A Ministry of Peculiar Occurrences Novel by Philippa Ballantine and Tee Morris. 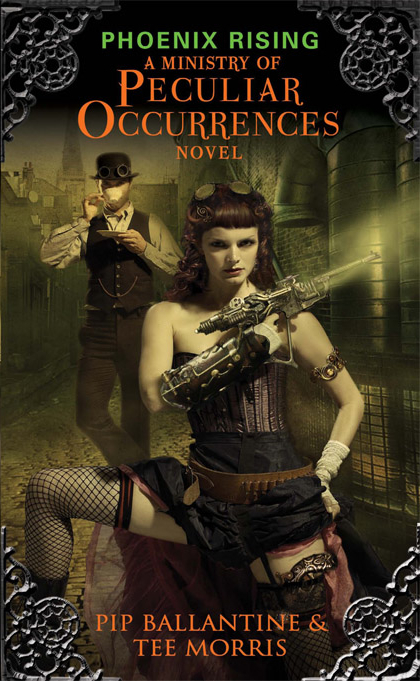 It is a steampunk adventure story featuring an unconventional red head from New Zealand and a mild mannered archivist from London. They must fight the forces of the destructive House of Usher, the arch enemy of the Ministry of Peculiar Occurrences. Agent Braun has a bulletproof corset and a fondness for dynamite while Agent Books is more comfortable in the library than in the field. I’m only a couple of chapters in and though it hasn’t grabbed me the way George Mann’s novels do, it is quite enjoyable. My current hardcopy book is The Dragons of Babel by Michael Swanwick. I’m 50 pages in and I’m still not quite sure what’s going on. 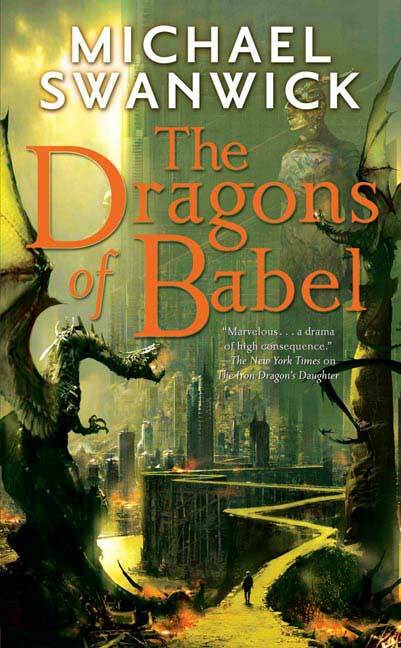 The Dragons of Babel is a sequel of sorts to The Iron Dragon’s Daughter, which I have not read. The novel throws you into a post-industrial Avalon, which is in the midst of a war. The greatest weapon are the iron dragons, sentient machines that bond with their pilots. Will, our protagonist, is out stargazing one night when one of these dragons gets into a fight near his village. It wins, but has no wings and no pilot. It declares itself the new king and forces the villagers to serve it. It takes Will as it’s agent, thus setting him apart and against his former friends. Nothing is explained. Will and his village are just there as you open the novel. They go about their daily lives, which are almost what you would expect of a semi-medieval rural fantasy setting, but then suddenly Swanwick will throw something totally bizarre at you. These are things that are so everyday within the world you’re reading about that the narrator doesn’t feel the need to explain them. When Puck Berrysnatcher is grievously wounded the wisewomen stuff him with mud, swaddle him in linen, and bury him for a few weeks. Um… ok. It works, but the reader doesn’t know enough about the world to expect it to. There is a truth speaker. Of course she is bare breasted when performing her duties. All the truth speakers are. Oh. Ok. Will’s aunt makes sacrifices to… someone. People have secret names that can kill them. Oh, of course. None of this is explained. You just pick it up as you go along. It’s not necessarily bad, but I’m 50 pages in and I’m only just getting the feel of how the world works.